The first unofficial issues were printed 'on behalf' of rebel groups fighting for recognition. Examples are stamps for the 'State of Oman' and 'Dhufar', (see 'History'), and the Spanish Sahara. Unofficial issues became a major problem with the disintegration of the former Soviet Union. Huge quantities of 'provisional' overprint issues on obsolete Soviet Union stamps appeared on the market, followed by hosts of 'regular' issues. Very convincing 'postally used' examples of Soviet republics overprint stamps are on the market, but even these are fake. Apparently, it is very easy to persuade a post office clerk to cancel the odd item . . .
Part of a set of eight. NONE of the stamps issued for ANY Russian province or republic is official. 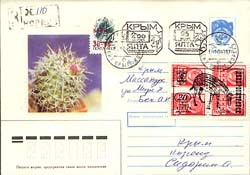 But not all of the stamps alledgedly issued by the newly independent former Soviet republics are official, either; unofficial issues for Georgia, Kirgizia / Kyrgyzstan, Tadjikistan, Turkmenistan, etc, are plentiful. Many 'stamps' have also been printed for countries with no properly functional postal authorities, such as Somalia and Afghanistan. Stamps labeled 'Somali Republic', 'Somaliland', and 'Afghan Post' are all unofficial. It is almost a shame that these pretty fossil stamps are unofficial. Regrettably the names of the fossils are not provided. 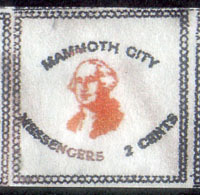 Part of a sheet containing 9 stamps. Recently, the problem seems to have spread even more, with obviously unofficial issues for countries such as Mali, Niger, Rwanda, and East Timor. The BBC documentary series 'Walking with Dinosaurs' has inspired a number of these issues. 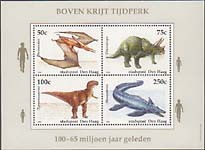 Examples of stamps with images taken from 'Walking with Dinosaurs'. Both from sheets containing 9 stamps. In the Netherlands, commercial local mail services started operations in the nineteen eighties. The national mail (PTT, later KPN, and now post.nl) took legal action, but lost. Although some local mail services have issued many pictorial stamps, targeting collectors, limited interest among philatelists soon put an end to this. 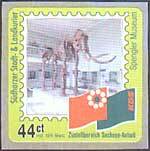 Thus, there are few local mail stamps with prehistoric animals. I am aware of only four issues. 1993 Christmas stamps, child's drawings. Two values, 45 cent and 60 cent. 20 Values (38 c.-f. 12.50), ten different designs. I have postally used specimens in my collection. This combined issue also exists imperforate with overprints in red in the sheet margin, 'HONG KONG '94 STAMP EXHIBITION' at left, Chinese characters at right. Persistent rumour has that a stamp dealer is heavily involved in these two combined issues. Since circa 2000, private local and regional mail services are active in Germany. The 'Südharzer Stadt- & Landkurier' issued a set dedicated to the Spengler museum. Both the 36 and the 44 cent value show the skeleton of Mammuthus trogontherii, also known as Archidiscodon. 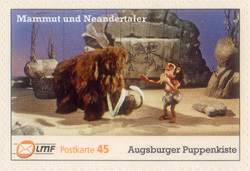 Augsburg-based regional mail company 'Logistic Mail Factory' has issued a number of sets dedicated to the puppet and puppet-theatre museum 'Augsburger Puppenkiste'. One of these shows a mammoth and Neanderthal man. Issued self-adhesive in sheets on 10 and as a set in a gummed sheet. Local mail issues exist for a number of Scottish islands. I gather that they are intended to send mail from the island to the mainland, where the UK Royal Mail takes over. However, I have never seen any postally used covers that might prove this. 2015, a visitor of my site mailed me a couple of scans of items (mostly holiday letters and cards) that prove that these issues really do occur postally used. I still have to find any items bearing stamps with fossils. Part of an imperforate sheet containing two values. Despite the label 'Goniatite', the sutures on the depicted ammonite clearly show it to belong to the Ceratitidae. Detail of an imperforate sheet with four values, part of a set of two sheets. Set of three values 'Seamail service to Skye' with fossils, issued in 1981. The 10 p. value shows Pseudopecten, the 15 p. value Gryphaea, the 25 p. value Uptonia. Part of a sheet containing two values, the issue also includes two imperforate miniature sheets. 'Tortuga' is 'turtle' in Spanish. 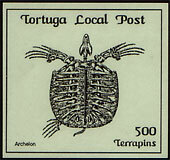 Thus, the depiction of Archelon on the '500 Terrapins' (whatever) value of the local mail stamp from the island of Tortuga makes some sense. The missing hind flipper is correct, the image is based on a picture of a specimen in the American Yale Peabody Museum. The animal had lost its flipper, probably to a predator, but had survived this. The Placochelys on the 250 Terrapins value is a bit of a mystery, even though it does look somewhat like a turtle. Internet auction sites provide great opportunities to obtain items from around the world. This is how I got this cover from Neuquen, Argentina. 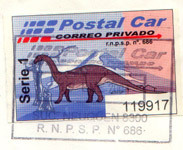 I knew important dinosaur finds have been made in southern Argentina, but this self-adhesive label from the 'Postal Car' private mail company was a surprise. Cancelled on the 19-th of january 2004, it probably shows the prosauropod Mussaurus. Also acquired on an internet auction site is this issue from Mammoth City, U.S.A.
Robert Margulsky kindly informed me that these were issued by a local mail company in the mining town of Mammoth City in central California in the 1880's. The company took care of mail from the mining town to the nearest U.S.P.S. post office. The person on the stamp is G. Washington, the first U.S. president.